The Senate has voted down a bill that would have banned abortion after 20 weeks. This is good news. It’s also part of an elaborate build-up of infuriating political theater that will result in Congressional Republicans throwing a tantrum next week and shutting the government down over abortion. Despite its failure, anti-abortion politicians still saw getting the bill to a vote in the Senate as a huge step. 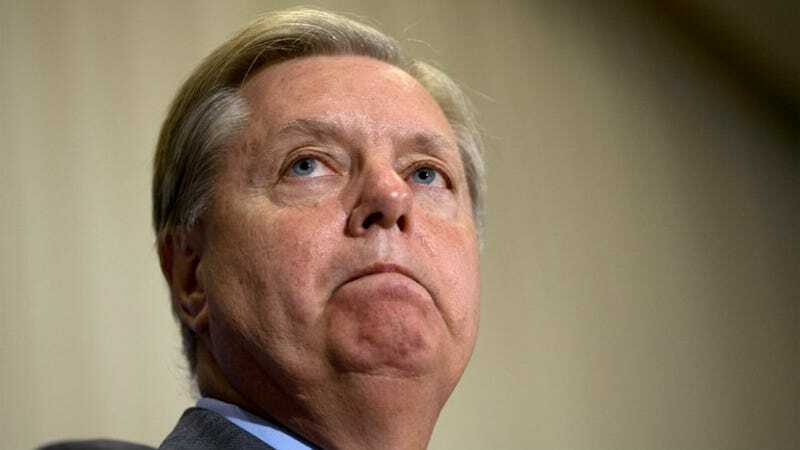 As Politico points out, Senator Lindsey Graham had been trying to get the bill to a floor vote for some time, introducing a 20 week-ban bill earlier this year just weeks after a federal appeals court ruled that 20-week abortion bans are unconstitutional. Today, Graham held a victory lap press conference on its failure, accompanied by Marjorie Dannenfelser, the president of the anti-abortion Susan B. Anthony List. “We applaud today’s vote by the U.S. Senate opposing a ban on abortions after 20 weeks. This bill would have represented a clear blow to women’s access to needed reproductive services and was an example of gross legislative interference. Leading medical groups agree that a 20-week ban on abortion, if passed, would interfere with the patient-physician relationship at a time when women are in need of quality, compassionate care. These medical decisions should be made solely by women in consultation with those she trusts the most, including her gynecologist – not politicians. “The American people should no longer be forced to fund the abortion industry; therefore we will oppose any government funding legislation that would authorize or provide federal funds for Planned Parenthood,” the text of [Cruz’s] letter, addressed to Sen. McConnell, reads. But the letter has faced opposition from fellow Republicans, with Sen. Kelly Ayotte, a Republican from New Hampshire, sending a letter back to Cruz in response, pressing him on how his strategy will result in anything other than a government shutdown. Safe to say that the “appeasement” vote didn’t work, and this time next week, Cruz and his fellow diehards will be busily driving the country headlong into a brick wall. Correction: An earlier version of this story incorrectly said the vote had been 54-42 against the bill. I regret the error.